The Rubbish Diet: Can you help Blue Crane Recycling help people in need? Can you help Blue Crane Recycling help people in need? Have you ever had an email from someone overseas asking for help? Like me, you've probably had many, marked them as spam and deleted them from your mailbox for good. But one message stood out earlier this year. It was from a lady called Megan Cockroft, who is fighting to set up a recycling initiative to help some of South Africa's poor and this is what she said. 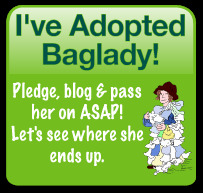 "I know I am taking a chance here but I was wondering if you perhaps know of a recycling organisation in your country that might be interested in sponsoring such an undertaking? 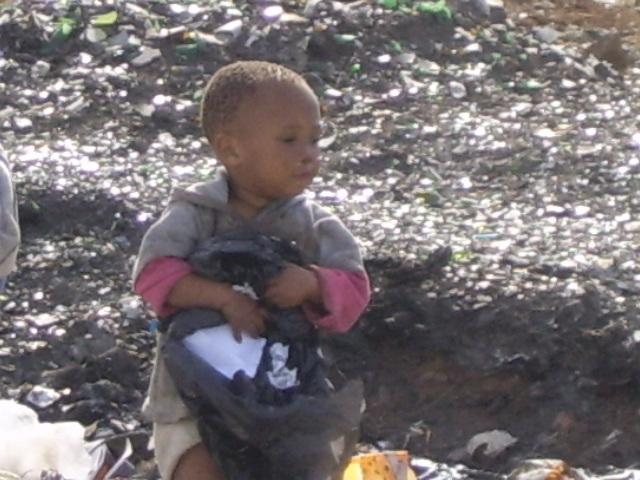 At the 'dump site' there are scavengers, very poor people that live there and scratch though the garbage daily with their children, little babies walking in the filth. My first aim is to create a creche for these children away from the dump-site, a clean healthy place with proper food and care and schooling. The second priority is to help these people to earn an income for themselves by creating self employment opportunities and job creation. When the recycling facility is set up a number of these people will be employed on a permanent basis, the rest will be used to sort the waste into different categories such as glass, tin, plastic, paper etc. this will be weighed and paid accordingly. As the business develops we will look to incorporate housing facilities for them as well". Well, could you turn your back on such a request for much needed help? I certainly couldn't, so short of flying out to South Africa I endeavoured to find out more about Megan's project via a series of lengthy emails and work out how best I could offer my support. The starting point is to share her story here in the hope to link Megan with organisations and individuals who can lend a helping hand. Originally from Port Elizabeth, South Afica, she and her husband Rick decided to move their young family away from the city to a small town in the Little Karoo after an experience of violent crime and numerous house breakings. This was almost three years ago. Within twelve months of moving to the country, they set up a small recycling business, Blue Crane Recycling, a great idea, but one that has been fraught with a number of stumbling blocks. However, no matter how tough, Megan's journey has forged her inspiration to set up an enterprise that will help others who are in greater need than her. "We initially got the business off the ground and started working," Megan told me, "but seven months later we had a terrible fire at our work premises and nearly lost everything. Our local municipality granted us permission to move the business to the local dumpsite and subsequently gave us a five year contract to process and recycle the entire town's waste on condition we got the neccessary permit". Following the change of location, Megan has been a regular visitor to the dumpsite and this is how she learned of the local people's desperate plight. 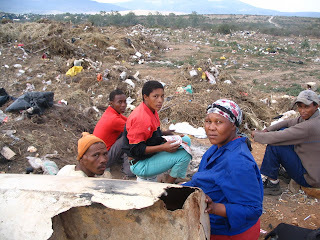 "There are about 15 - 20 people who live and scavenge at the dumpsite" she says " I now know most of them personally and always try to help them in any way that I can but I have realised that they are not benefiting from handouts, what they need is a source of income. Once we have set up the business on the site, I plan to give them the tools to help themselves." "At they moment they are living on less than R50 per week, which roughly converted to pounds is about £4.50 and most of them have families to support as well. Through our Environmental Impact Study, based on the current volumes of trash and potential recyclable volumes we have estimated that they will earn R400 (£36) per week or more. Although this is not 'fireworks' it will assist them considerably." Megan and Richard hope to employ 5 people on a permanent basis and create 20 -25 self-employment opportunities to support the people who live and scavenge on the dumpsite. There is great support from the community to make this happen but the Cockcrofts have found it impossible to get funding from the local authorities. That's why she has turned to the international community to seek help. Blue Crane Recycling is not a registered charity, but is closely associated with the charity organisation Afrikaanse Christelikke Vrouens Vereniging (ACVV), which provides social welfare services for families in need. ACVV will manage all funds allocated towards Megan and Richard's recycling project to ensure that monies are spent correctly. Megan is already involved with voluntary work with the organisation, handing out bread, fruit and cold drinks every Friday to under-privileged children in their part of town. I asked Megan what kind of support she needs. "To start with we need about R150 000 (roughly £13,000). This is mostly for the purchase of 2 LDV's which is crucial given the demographics of our town and distance to point of sale (210 km). Fencing is also needed to enclose the area we work in so as to contain the garbage as well as basic equipment for the sorters, namely spades, wheelbarrows etc". For equipment and machinery etc, we require a further R200 000 (£17,500) The sooner we can get operational the sooner everyone can start earning an income and improving their lives. One of the benefits of this business is that there will always be garbage and always recyclable goods and profit can be seen almost within two weeks of operation. The most critical of all is a vehicle to get the recyclables to market,from then on we can slowly build up our the enterprise". There is great scope for this project and once fully functional Blue Crane Recycling will be able to process cardboard, paper, mixed plastics and glass, putting an end to it being buried or illegally burnt on the dumpsite. I am aware of a couple of organisations with whom I can put Megan in touch, but I know there are many readers of this blog who have greater knowledge than me about international fundraising for children and families in such poverty as well as contacts in recycling organisations that might be able to help. Just sharing this story via Twitter or Facebook could even help. If you have any ideas or connections with a recycling organisation that might be keen to get involved with social enterprise projects or are even considering investing in businesses overseas, Megan would be delighted to hear from you. 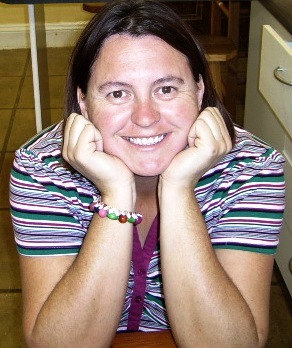 Her contact details are bcrecycling@r63.co.za. Thank you so much in advance for anything you can do. ADDENDUM, 15 Sept 2010: If anyone wants to make an individual donation, Megan has just informed me of the account details for the ACVV charity branch that is local to her, where direct transfers can be made. All monies will be managed by the ACVV charity, but you need to reference any donation with BCRECYCLING to ensure the funds are allocated to this project. Megan will keep us up-to-date with how much is raised and how the project is progressing. This post was compiled during National Zero Waste Week 2010, whilst I was blogging from Saints Cafe in Bury St Edmunds about their fabulous ides to help minimise food waste. The Blue Crane Recycling project was never far from my mind and what struck me this week was the statistic that an average family wastes £50 per month, throwing away food that could have otherwise been used if it was stored or managed properly. It's blue sky thinking but what if all that money could be used to help level the imbalance of poverty instead of food that's left to rot in landfill? It just highlights that the food waste problem in the UK is not just an environmental problem, it's a wasted opportunity to help alleviate poverty too. Now that I've had more time to browse this site and understand your long terms goals, I salute you. I would like to raise one issue: landfill (I appreciate that I sound like I work for a landfill operator?) is not necessarily the toxic death dump scenario it's portrayed in the UK. I appreciate that this posing refers to a far greater sadness than mere waste disposal but we cannot allow gross generalisations to cloud our vision. 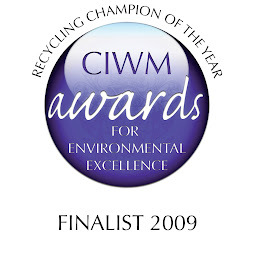 A good, well run UK landfill manages it's leachate and creates electricity from the methane. Landfill will not run out in the UK in seven years unless it's financially viable for it to do so - it's a bit like no-one dies from a lack of water - but living where it's not financially viable to pump it there. The only way to achieve zero landfill is by living naked on a sunny island with lots of natural flora and fauna. Incineration (a big bonfire in a can) generates 15% ash which as you have previously mentioned, goes to landfill and kills off the resource. Landfill on the other hand is safe and environmentally friendly if managed correctly which we do extremely well in the UK. I try to minimise my purchases of heavily packaged items, I buy things in glass wherever possible (to recycle) and not one scrap of food goes into any waste sack from my house (foxes are a fine example of waste-2-energy). I still produce at least one sack of waste per week and see no problem with it going to a beautiful (in years to come) landfill site - I do get your drift though and commend you. This is the appeal I was thinking of. I have just e-mailed the group about it as there is a chance one of the members has links to a recycling company. It is made up of quite a wide variety of people. Any more news on Blue Crane Recycling?